Handsome Hunk Rana Daggubati is all set to play an antagonist role once again in Dhanush's new film titled Ennai Nokki Paayum Thota film. Touted to be an action entertainer, the movie is being directed by Gautham Vasudev Menon. Recently the film's first schedule has begun with showcasing crucial scenes on Dhanush and Rana is expected to join the sets of Dhanush's movie in the second schedule. The film is based on Mumbai backdrop where Dhanush will be seen in Gangster role. 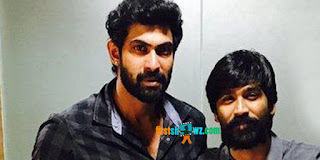 More details of Rana Daggubati's role in the film will be unveiled shortly.